Welcome to Nike Training Club, your Ultimate Personal Trainer. Get fit with 175+ free workouts from strength and endurance to mobility and yoga — featuring our world-class Nike Master Trainers in every drill. If structure is what you need, our personalized training plans adapt to you and your schedule for a one-way ticket to the body you want — whether you’re a seasoned athlete or just getting started. Our Workout Collections offer a set of recommended workouts and expert advice to help you focus your routine and make progress toward your goals. Themes center around goals like getting leaner abs, developing muscle tone, and more. 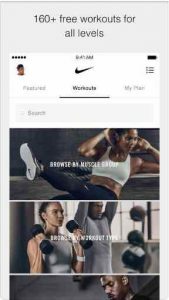 And don’t forget — Nike Training Club also syncs your workouts with Apple Health.